iOS wouldn't be where it's at if it weren't for third-party apps. Now the App Store does more to help you find the app you need. The App Store might be the most important app on iOS. Where would we be without third-party apps? The app store—and those apps—are the beating heart of the entire ecosystem. You’d expect Apple to treat such a vital part of its ecosystem with care, and it has. Updates to the App Store have been incremental. New features get added, and the look and feel changes with the operating system design trend of the era. But with iOS 11, things really change. The App Store has been redesigned from top to bottom, and in large part the changes are smart. Important items have been highlighted, less important ones de-emphasized. Games and apps have been separated into separate tabs, which seems like a smart decision. It gives both types of apps room to breathe. The redesigned app detail pages are solid, with large icons, big purchase buttons, and prominent display of the average rating, app ranking, and age rating. User reviews are still there, but they’re down in a separate section in a side-scrolling section. The App Store on an iPad. Then there’s the new App Store content. That’s now the App Store has an editorial sensibility that simply didn’t exist before. There are articles on the App Store, and lots of them. Apple has taken a relatively light touch with App Store content in the past, acting as a curator and choosing which apps to promote. But in the redesigned App Store app in iOS 11, app highlights go way beyond buttons presenting an app’s App Store page when you tapped. 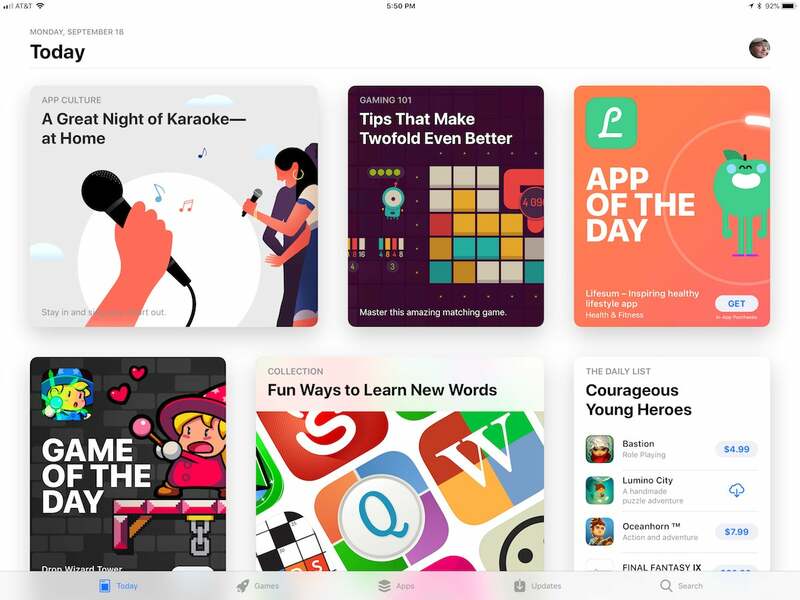 The App Store’s new Today tab is populated with full-fledged articles, featuring screen shots, videos, animations, pull quotes, and real writing. There are app spotlights, curated best-in-category collections, and even how-to articles and game tips. Over the summer, I’ve been reading the sample content that Apple posted in the App Store as a part of the beta release of iOS 11. I’ve been impressed with the quality and level of detail. These aren’t a few sentences of dashed-off app hype. It will be interesting to see how the App Store content changes now that iOS 11 is here and the App Store team will be rolling out new highlights and features on an ongoing basis. That’s the thing about editorial work, whether you’re writing for a newspaper, magazine, website, or even the App Store—it never stops. Time just keeps rolling on, and your audience is always hungry for new stuff. Fortunately, given the experience of the last nine years of the App Store, there will probably always be great new apps to highlight and great stories to tell. As someone who has made his living writing stories about software for a very long time now, I’m a believer in the format. Done well, this will make the App Store better for both users and developers.